Yehey! 22 days to go and it’s Christmas Day na! I’m so excited! Kasi after Christmas, New Year na, Birthday ko na and Birthday na ni Rhian. Yahooo!!! 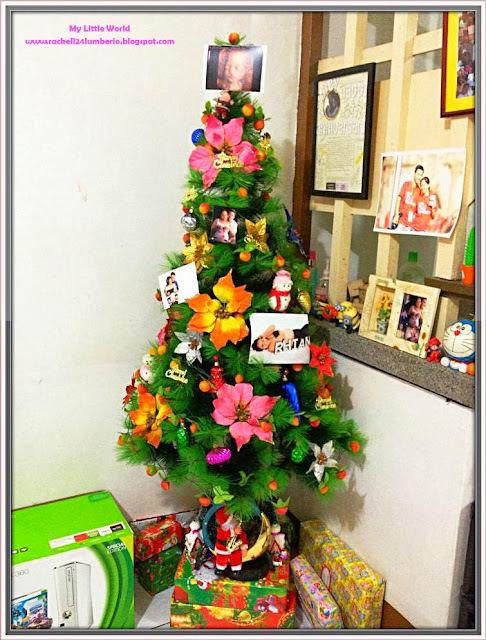 Anyway, our Christmas tree is up already and I want to share with you our simple yet meaningful Christmas tree. This year, we decided to put our baby’s 3D picture on top instead of putting the traditional star because for us, Rhian is the star of the year. We also put our maternity shots around the tree which symbolizes love of the family. So next year (Christmas 2014), expect us na iba ulit ang design ng Christmas tree namin.